Apple Preparing Move to Expanded Space at Largest Mall in U.S. Despite being located in the largest shopping mall in the United States as measured by leasable square feet, Apple's King of Prussia retail store at the King of Prussia Mall outside of Philadelphia is nothing special by Apple's standards, occupying a fairly small amount of space with just 30 feet of frontage inside the mall. The store is one of the older ones in Apple's chain, having opened in November 2002. That will be changing within the next few months, however, as MacRumors has received a few details on a new space Apple will be occupying in a redeveloped section of the mall. 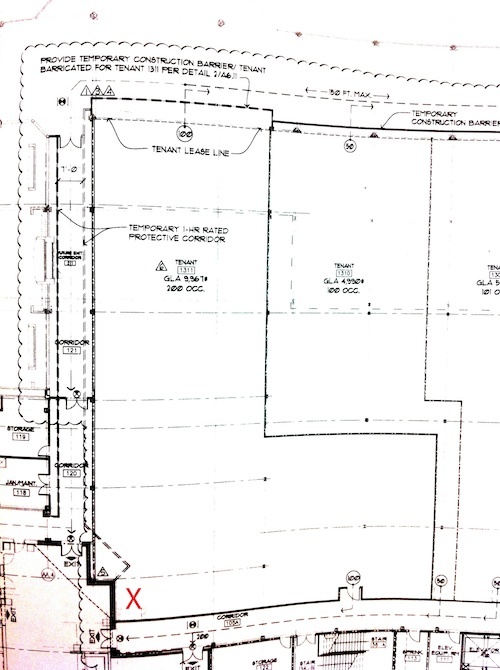 According to construction documents, Apple's new location in space #1311 will measure nearly 10,000 square feet and occupy an L-shaped footprint within the mall, although some of that space will undoubtedly be set aside for back-of-house operations. Our source was able to obtain a photo of the interior of the space Apple will occupy, and it is clear that Apple has not yet begun to build out the distinctive details that will make it immediately identifiable as an Apple retail store. But with the space currently in shell condition, Apple should be able to move relatively quickly on construction to fit out the new store. An opening date for the expanded location remains unknown, but Apple typically tries to have each year's batch of new stores opened by mid-November so that they are ready for the busy holiday shopping season. Never understood the fascination with a big empty room containing rows of plain tables with Apple stuff on them. What's so cool about an Apple store ? You can get all that stuff online without hassle. Is it the clueless inept jokers at the " genius" bar who never really offer a good solution other than buying newer Apple crap because they haven't the slightest clue as to how to actually fix a problem? Is it the over priced accesories that will be obsolete in a year ? Is it the hordes of people who stand in line for something that they could just as easily order online ? Apple only has a handful of products ! Like you have never seen an iPod or an iMac or an iPad ????? There is a mall bigger than Mall of America!? The Apple Geniuses are great. They are good for more than just Apple support. They helped me write my master's thesis and my doctoral dissertation in molecular biology. I have been applying to get a job in the Apple Store at Penn Square Mall in Oklahoma City (Working in their Cancer Research Department), however, they want me to do some postdoctoral work or get a degree in particle physics to supplement my current education. I will say, the math and foreign language portions of the Apple Standardized Intelligence Tests were the most challenging tasks of my life. Note: I understand, Apple has changed it's policy and anyone holding a Nobel Prize in any field is automaticly granted a position in an Apple retail store, however, they must work their way into a position as a creative or Genius. This may be the easy way to go. But I had more to say than that and provided some valid points. I also wanted to express my opinion of this zombie like obsession with the Apple store and why it makes no sense to me. It IS related to the discussion even if you don't agree with my point of view. Furthermore , I will NOT phrase my questions as you would. You don't get to decide what I have to say or how to say it. If you want to ask a stupid question like that, go right ahead. I'll be me and you be you. We will respect each other's individuality and you will no longer try to put words in my mouth. Let's try that next time! To be respected, you must earn respect; your comments do not earn you any respect. You are combative and abusive then pretend to be insulted when someone confronts you with this observation. Such activity is obvious trolling with the intent to hijack a discussion with a flame war. Personally, I like the stores because I like to touch and play with items before I buy them, especially electronics. If I was not able to try the new glass trackpads with multi-touch back in 2008 in the new unibodies, I probably would own a Dell and would never have joined this forum. The experience of the trackpad's amazingness sold me on buying a Mac. Mall of America is bigger when including the theme park, but smaller when comparing actual retail square footage. I don't think it's necessary for any of you to be speaking to one-another like this. This is a tech forum; personal attacks derived from our passion for or against these products is not what this space is here to provide. Collaboration and discussion is what it's about. Attack the brand and the products, not each-other or his/her ethics. I don't condone the way the first negative response was given to you, but anyone who decides to read your whole post can clearly see you are fishing for it and then acting surprised when it happens.